Small but perfectly formed, the Z2 takes decent pictures and syncs well with a Mac. 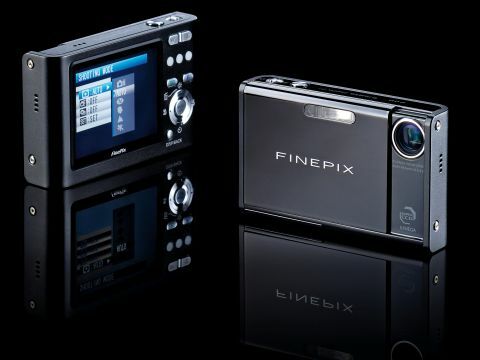 Few things slip into your pocket and look better than Apple's black nano, but Fujifilm's FinePix Z2 comes pretty close. There's a svelte grace and finery to this camera that makes it a pleasure look at. It's petite among compacts - flicking through the buttons of this camera with a big thumb feels a bit like attempting to do origami with oven gloves. The Z2 is a 5.1MP digital compact with a periscope lens that can shoot stills or movies and play back either on a TV or a Mac. It can do this out of the box with the cables supplied, and integrates perfectly with iPhoto or iMovie HD. We imported the default movie (AVI) and photo (JPEG) files from the docked camera to our hard drive without a hitch. Playing back video on a TV was equally easy, using the boxed RCA lead, although this showed up a problem with the camera: being so light it picks up minor shakes in video mode. There is no tripod screw dock to counterbalance this. The microphone, on the other hand, worked very well. The controls are mostly on the rear and are straightforward to use, but cramped to one side by the generous 2.5-inch LCD. The only real drawback with the Z2 is that it needs the dock in order to charge or connect via USB 2.0 to anything. You cannot connect to a power supply, computer or TV without the dock, and we did try. The only dockless workaround is to remove the xD card and upload files to a Mac using a card reader, but you would need to buy the reader separately. The dock also has no remote, which would have come in very handy for TV playback. Some accessories are available that address these problems, like a BC-65 battery charger, but again, you'd have to buy them. The camera took good shots indoors with little light, helped by the Z2's Natural Light mode. The Z2 can also be set to a maximum sensitivity of ISO 1600, which is faster than most compacts and ideal for shooting in low light conditions. The colour saturation of the images, while nicely warm does edge towards oversaturated, but only just. You don't really need the boxed software if you have a Mac. Fujifilm's FinePix Viewer is Mac-compatible, as is the RAW file converter. We installed the software and had a poke around, but it's unlikely anyone would prefer these applications to Apple's iLife software.